1) It was announced on Wednesday that Miami Cigar & Co. and Don Pepin Garcia have partnered to release a new blend. 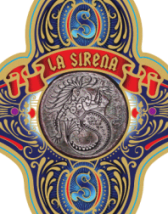 Called “La Sirena” (Spanish for “mermaid”), the five-vitola line will sport a Connecticut broadleaf maduro wrapper, a dual binder of habano and corojo tobaccos, and a filler comprised of criollo ’98 corojo ’96 leaves. “We are very happy to finally have that full-bodied cigar in our portfolio,” said Rene Casteñeda, vice president of sales for Miami Cigar. “We have never produced a full-bodied cigar of out the My Father Cigars factory until now.” La Sirena will be introduced at Casa de Montecristo in Chicago on November 19; it is expected to retail in the $8-10 range. 2) The Honduran Association of Tobacco Growers and Cigar Makers is hosting a five-day cigar event in February. Called the “Humo Jaguar Festival” in honor of an ancient Mayan ruler, the event will feature seminars on tobacco blending and guided tours of the country’s cigar factories. Tickets cost $1,250 per person and include hotel accommodations, meals, and excursions. 3) Inside the Industry: Sam Leccia will be leaving the Oliva Cigar Company. With Leccia gone, Nub and Cain will remain owned by Oliva and become part of it’s new Studio Tobac project. Details about Studio Tobac can be found here and at its recently launched Twitter feed. 4) Around the Blogs: Smoking Stogie smokes a Liga Privada JD No. 4. Stogie Review reviews a Tatuaje Verocu 5. Cigar Inspector inspects a Tatuaje Black Tubo. Cigar Fan fires up a Nosotros. Tiki Bar examines the Casa Fernandez Aganorsa Leaf. 5) Deal of the Week: Rocky fans may want to jump at this Rare Rocky Patel Blends Sampler. For just $50, you get four cigars each from the 1961, Patel Brothers, and Signature blends. Grab your here. photo credit: Miami Cigar & Co.